Fill the windshield-washer fluid reservoir periodically. Add windshield-washer fluid when the low windshield-washer fluid warning light comes on. To fill the windshield-washer fluid reservoir, lift the cap off the reservoir and pour the windshieldwasher fluid into the reservoir opening. Add a washer solvent to the washer for better cleaning. In the winter season, add a windshieldwasher antifreeze. Follow the manufacturer’s instructions for the mixture ratio. Refill the reservoir more frequently when driving conditions require an increased amount of windshield-washer fluid. Recommended fluid is Genuine NISSAN WindshieldWasher Concentrate Cleaner & Antifreeze or equivalent. Do not substitute engine antifreeze coolant for windshield-washer fluid. This may result in damage to the paint. 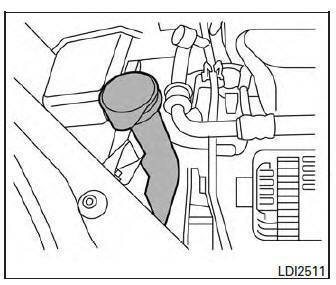 Do not fill the windshield-washer fluid reservoir with washer fluid concentrates at full strength. Some methyl alcohol based washer fluid concentrates may permanently stain the grille if spilled while filling the windshieldwasher fluid reservoir. Pre-mix washer fluid concentrates with water to the manufacturer’s recommended levels before pouring the fluid into the windshield-washer fluid reservoir. Do not use the windshield-washer fluid reservoir to mix the washer fluid concentrate and water.